Honduras is the second largest country in Central America, with its territory about three times the size of Taiwan. The country is adjacent to Nicaragua and El Salvador on the south and Guatemala on the west. To the north, the 644-km coastline lies along the Caribbean and 124-km coastline along the Pacific. 3/4 of the land in the country is covered with undulating hills and mountain ranges, with their altitude running from 300m to 2,850m, while its lowland is primarily located at the coasts and major rivers basins. The local climate is relatively clear-cut, and there would are conspicuous changes going between the high mountains in inlands and the lowlands along the coast. Generally speaking, the climate in inlands is relatively cooler than coastal lowlands, while its rainy season goes from May to October. However, it rains all year long in the Caribbean coast. As a whole, 90% of the population is people of mixed Spaniards and indigenous Indians, while there is only 7% purebred Indians who live scatted around the country. Much affected by colonial culture, the official language is Spanish and Catholicism is the national religion. The ridges soaring high into the clouds surrounded by mountainous mists are called as "Forest in Tears!" This is the area with perennial greenery and emerald forest throughout the year, and trees are found grown full with fungus and fern. At the north and south coastal area, there stand great and large mangrove, which is distributed around swamps and live lagoons. Since the entire north-east coast is infinitely endless without any trace of humans, it is called mysterious corner of "The Coast of Mosquito," and desolation and remoteness are considered a part of the rain forest in South America. Being the habitat of primitive tribes, tourists can have a view of the sights by plane or boats. 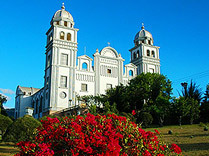 With its geographical location close to Guatemala, Copán is located 225km northwest of the capital. Situated on the canyon belt of 13km long and 2.5km wide, Copán is built 600 meters above sea level. As a whole, the city covers an area of approximately 15 hectares. Since the unique and massive stone monuments are housed in this city, Copán ranks among the most important of Maya sites. if Tikal temple is likened to New York of Central America, Copán can, undoubtedly, will be likened to Paris. 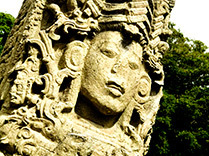 Aside from highly complicated stone monuments of temples, Copán is the site of relics highly understood and researched. Besides, world-class archeological studies have indicated that Copán is the only spot with relics of Maya Queen found, and this archaeological news was once reported on some journals equivalent to the renowned National Geography. 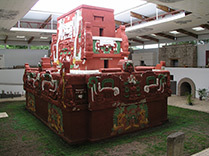 In addition, authentic stone relics are displayed in Copán National Museum that highlights the city as an important archeological area, thus leading the city to be enlisted into "World Heritage List" according to the assessment criteria of world heritages by UNESCO and having drawn visit from many scholars and tourists with 100,000 visits per annum. 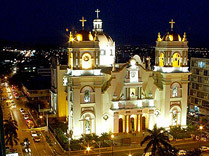 San Pedro Sula is about 4-hour travel distance from Tegucigalpa and is the major industrial city in Honduras. Being the economic hub, San Pedro Sula is the second largest city of the counry with the local culture combined with construcution nowadays and its features well preserved. As close to the port and modern airport geographically, the city has played a critical role in mastering the economic lifeline of Honduras in recent years. Since its geogrpahical lcoation close to Copan relics of Maya culture, the city will be the best starting point for travel to Caribbean Sea, and considered as the important transportation hub of the country at the north. In comparsion to Tegucigalpa, the capital, San Pedro Sula is heading towards the fast development as a commercial, financial, and industrial city. Within the city, it is well preserved with many of the buildings and architectures built during Spanish colonial perd, and tourists can experience the unprecedented exotic style. 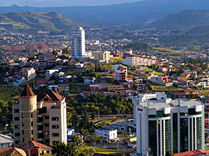 Built 1,000m above sea level, Tegucigalpa is the capital of Honduras enjoying a pleasant climate. Tegucigalpa means "silver hill" etymologically as Spaniards considered the city as the mining center in 16th century, and the name has been used till date. The center of attention of this city is a cathedral -- The Cathedral of San Miguel, built in 18th century, from which tourists can savor baroque art, proclaimed as the center of the city. Besides, there are many other attractive scenic spots in the periphery of the city, including the gigantic Gothic Basílica de Suyapa situated at he southeast of the city which was built to commemorate the patron god of Honduras. Coastal cities like Puerto Cortes, Tela, La Ceiba, and Trujillo are quite memories of the heyday of the banana traders. Tourists will have opportunity to view some ditch, black water lagoon, and isolated tropical beach, wild national park and habitat in swamp areas near the three cities. There is a botanical garden in Tela that will be the best choice for suppliers of vegetable and fruits to promote the exotic fruit trees. La Ceiba is a fast-growing city of natural ecology, and it is the peculiar historical paradox of national Pico Bonito Park. 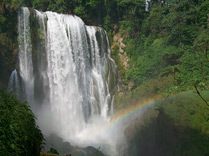 With high rainfall rate and soaring cliff have created a magnificent waterfall and a splendid scene in the rain forest that sketches the grandeur of River Cangrejal. 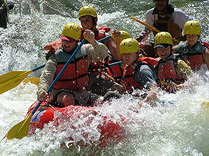 Besides, La Ceiba is also the pathway to gulf archipelago Bay Island as tourists can enjoy canoeing activities on River Cangrejal, hiking in the rain forest, exploration of the ditch, and wildlife trip to the wild habitat at Salado where visitors can have the opportunity to view beautiful monkey, American alligator, sea cow and water bird. Known for its charming island culture, coupled with the fantastic Caribbean scenery, paying a visit to La Ceiba will also lead tourists to the best site in the world for whale and shark watching. 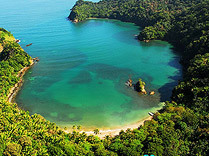 Only 15- minute flight from homeland Honduras will enable tourists achieve these goals. Gulf Archipelago consists of three major islands such as Roatán, Guanaja, Utila, and more than 60 small islands, with its location at about 50km distanced from the northern coast of Honduras. 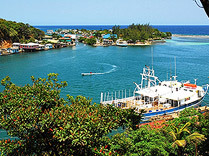 Fishing is the major source of economy for these islands, while fast-developing tourism in recent years has become one of the major sources of income. 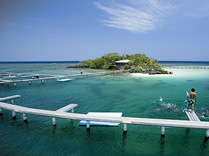 Roatán is the largest island among the rest with high development where there is one international airport. However, in comparison to high quality resort-management models practiced in Roatán and Guanaja, Utila still preserves primitive tourism resources as it is the smallest island among the three with the lowest tourism expenses. With their intriguing historical tales, these islands still preserve the outlooks in US and European styles till date as the local residents speak strong Caribbean English accent, all which are worthy of our experience.